A woman’s wardrobe is a place for her most private possessions. Intimate, cherished, well worn. But clothes no longer take pride of place in my walk-in-robe. Clothes are merely items to modestly protect the eyes of others. My wardrobe has spontaneously forged a new existence – as a bookshelf. What started as a humble pile of books stacked neatly on the floor by my bed, has now grown to a seemingly impossible load of novels waiting to be read. Every book, recommended by a trusted friend, or teacher. Or website. Titles scribbled down on scraps of paper, plugged into my phone, or jotted into my notebook. Searched and purchased as soon as possible. Brown cardboard boxes waiting for me on the doorstep, and that feeling of erudite anticipation as I unwrap my future. As the piles grew and teetered, and occasionally spilled over, a more permanent home was needed. A pile of clothes, unlikely to ever fit these hips again, were unceremoniously dumped into a plastic bag and shoved in a corner, and space made for the future of my nights. My future is unread books. My evenings tucked up in bed can be measured against Funder and Capote and Didion. And Drewe and Moss and Brown. Forget the worlds of science fiction or fantasy for me. I prefer to read stories that I know could happen. Even better if it did happen. My future is grounded, real and covered with dust. But not too much dust, as new surfaces are constantly being added, and the pile keeps growing, faster than I can possibly read them. My future of unread books is stretching, at this rate, into years. It is an easy decision to buy a book. It is a much more difficult one to choose which next to read. That feeling of relief and loss when a great story is finished, and the book moved into a permanent space is quickly followed by the anxiety of what to follow it with. Do you switch genre entirely and risk losing the familiar warmth of a world and characters you literally took to bed every night? Or does the bed grow cold when it is just more of the same. Like a man, sometimes the book can be right but the timing all wrong, and it needs to go back on the shelf. And what of the book which proves a major disappointment? Whose pages you struggled through, one eyelid drooping in anticipation of sleep, the other pressing on, waiting for ‘the good bit’ that was promised. And never finding it. That book is resigned to the box, to be donated. To be dumped. 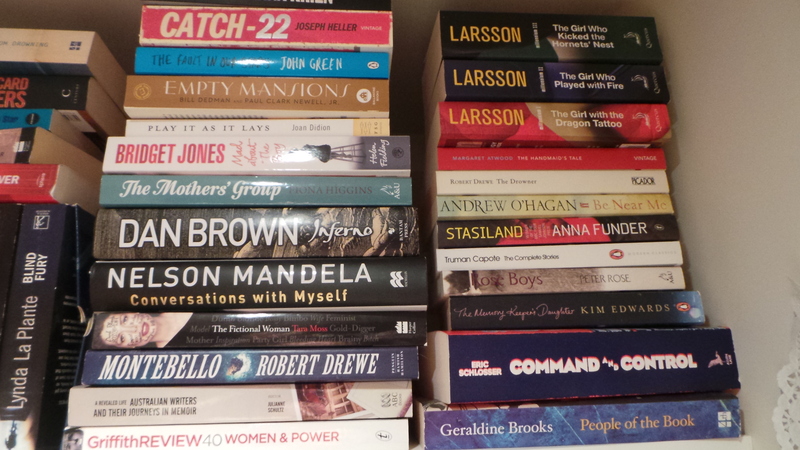 So many on my shelf are big names and big titles, usually found on a ‘read before you die’ list. I now – finally – own all the Larsson books, picked up for a song as a recent second hand sale. ‘You have to read them,’ I was told as I debated over my purchase. I have to… and I will, but when? I no longer have the stamina I had. Bedtime is becoming a time of… well… sleep. In my future of unread books, to devote what could be months to a single series is a major commitment. I really need some return on my reading investment. Each time I am faced with the choice of selecting a new book, I think about my future, and what if this is the last book I ever read? Better make it a good one. What other books should I add to my hidden bookshelf?